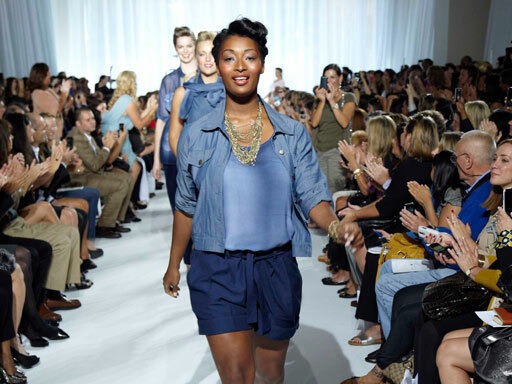 NEW YORK This year's New York Fashion Week proved the runway is big enough for women of all shapes and sizes. On Sept. 15, the Atrium in Frederick P. Rose Hall, home of Jazz at Lincoln Center, was filled with full-figured fashionistas who came to see the latest plus-size collections for spring 2011 and embrace their curves. Fashion icon and one of the top earning plus-size models, Emme, who is also the brand ambassador for OneStop Plus.com, hopes the event will open doors for plus-size women in the future during Fashion Week. "I think there is going to be a ripple effect from this fashion show to all of the fashion community, saying, '62 million women are a size 12 and above, why hasn't this been done before?'" Emme told CBSNews.com. She is also currently the host of the FOX reality TV dating show, "More to Love." Plus-size model Lizzie Miller, who has appeared in Italian Vogue, French Elle, Glamour and Marie Claire, was thrilled to strut her stuff on the runway, yet points out the misconceptions that surround the word "plus-size." "It's amazing that it hasn't been done to this caliber before, but you know what, I think it's about time. That's the biggest misconception that people have about plus-size models is that we are overweight and that we are unhealthy. No, this is me at my healthiest. I work out three to five times a week and eat healthy. The word plus-size doesn't sound the way that these women look." Other full-figured fashionistas, such as Oscar-nominated actress Gabourey Sidibe, "Hairspray's" Nikki Blonsky, who also stars in the TV show, "Huge," hit OneStopPlus.com's red carpet to show their support. While Sidibe admits that she loves to wear SPANX and that she's not a fan of heels, she says that one of her favorite clothing item is leggings. "America's Next Top Model" winner, Whitney Thompson, who says she's been bothered by the size constraints of Fashion Week and hates when magazines re-touch pictures, flew into New York as soon as she could to attend the plus-size fashion show. "To be at Fashion Week in New York and they are actually doing a curvy fashion show is just mind-boggling to me. I am thrilled to be here," Thompson said. So which country embraces women's curves the most? Drawing from her experiences of modeling around the world, Thompson says it's Spain and Germany. Hopefully, the rest of the world will catch on. While the recession jolted the fashion industry, proving that it can adapt with the launching of Fashion's Night Out, is it capable of embracing the plus-size movement?